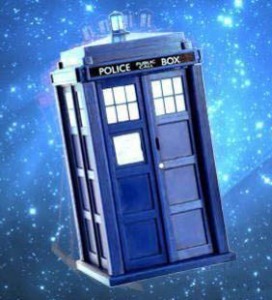 The 21st century version of the “Doctor Who” television show is an amazing example of multiracialist propaganda. As with the later 20th century version of “Doctor Who”, the good Doctor usually has a female companion. However, there is a stark difference between the old and new versions. In the new series, at least up to the 5th season, every companion had a black boyfriend. In a multiracial society, this sort of thing happens; but when it happens to every one of them, season after season, it becomes quite obvious that there is a pattern emerging, and that it is being done so as to push a particular social viewpoint, in a sly and underhand manner, using television entertainment as a vehicle for propaganda. If you were watching Communist or Nazi TV stations, then you could expect to see propaganda, but the ordinary person doesn’t expect to be the victim of propaganda in modern times, which therefore makes it all the more effective. Some people may say “What does it matter if it is propaganda?”; well, that’s fine, so long as they realise that such an attitude means that they tacitly support the tactics of all other regimes which use sly propaganda, television brainwashing, and psychological manipulation via the mass media. Anyone who defends brainwashing is a willing tool of whatever regime they live under. So, anyway, let’s consider this aspect of “Doctor Who”, with a look at his main female companions. Rose Tyler (played by Billie Piper) is the first Doctor Who companion in the new version of the show. She has a black boyfriend, Mickey Smith (Noel Clarke), who we are introduced to within the first two minutes of the first episode of season 1 (2005), so that the underlying direction of the show’s multiracialist intent is laid down straight away. Mickey is a nice guy, but a bit useless; so Rose, being a brave sort of girl, goes adventuring with the Doctor for a bit of fun. 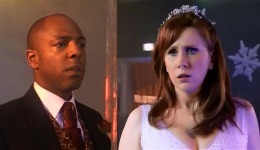 Donna Noble (Catherine Tate) first appeared in the episode “The Runaway Bride” (Christmas 2006), on the day of her wedding to her black fiancé, Lance Bennett (Don Gilet); but, after it turned out that Lance was in league with the Empress of the Racnoss (an evil spider-alien), her wedding plans came to a fatal end. Donna Noble was intended to be a one-show character, but she ended up returning (in 2008) as a main companion for the Doctor. So, two of the new Doctor Who companions have black boyfriends; but maybe it’s just a coincidence? Really? You think so? How about we look a bit further into the matter? Never one to stay single, Donna Noble gets engaged again, to Shawn Temple (Karl Collins); as seen in the episode “The end of time” (part one, 27.38). Shall we guess the racial background of her new boyfriend? Well, let’s see if we can work it out. As the show is set in Britain, which is majority white, the likelihood is that her second fiancé is white, yes? Well, actually, no. It turns out that he’s black too, just like her first fiancé. Wow, what an amazing coincidence! Who would have thought it? Donna later marries her second black boyfriend, as mentioned in the episode “The end of time” (part two, 61.43). Martha Jones (Freema Agyeman), a black woman, doesn’t have a boyfriend, but after traveling with the doctor, she falls in love with him, which she admits to in the episodes “The family of blood” (26.54) and “The sound of drums” (48.12). For the Doctor Who companions, that makes yet another multiracial love story, albeit based upon an unrequited love. Poor Martha. Martha was determined to get over the Doctor, and to put her romantic notions aside. Apparently, she was successful, as she eventually married Rose Tyler’s old black boyfriend, Mickey Smith; which is noted in the episode “The end of time” (part two, 57.06). 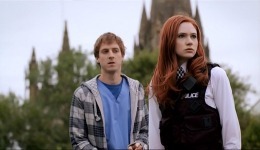 Finally, in season 5 (2010), the Doctor gets a new companion, Amy Pond (Karen Gillan), who actually doesn’t have a black boyfriend. And it only took half a decade for it to happen. Amazing. Amy’s boyfriend is Rory (Arthur Darvill), a white Englishman (which, of course, is a tautology, unless you are a civic patriot and believe that Africans, Asians, and Eskimos can be Englishmen too, just because they become English citizens or are born in England; however, it would serve them well to remember that when a dog is born in a stable, it does not make it a horse). Maybe the makers of the show decided that if they had another Doctor Who companion with yet another black boyfriend, the pattern of “coincidences” would look so suspect that even the sleeping masses would wake up to the fact that they were being manipulated. What is the point of the Doctor Who propaganda? So, what’s the message of this TV show’s propaganda? Most white women should get themselves a black boyfriend? Multiracialism is good? 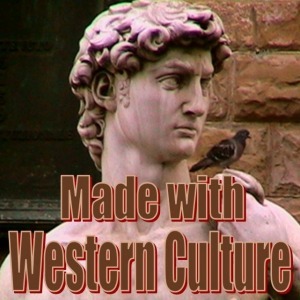 The white race should be wiped off the face of the Earth by miscegenation? Let’s import millions of black people into Britain, as they’re great fun, and, besides, what could possibly go wrong? Whatever the exact propaganda intention of the show is (and it’s not hard to spot the general theme of their intent), it is obvious that the TV series has been utilized as an instrument of propaganda, as a way for the show’s makers to subtly incorporate their social and political views into the television entertainment that they make, as a means to psychologically influence the general public towards their own way of thinking, so as to boost their own social and political agenda. This is like subliminal advertising for political purposes; hardly a boon for democracy. This type of propaganda is very sly, devious, and manipulative. Actually, regarding the new lot of Doctor Who shows, all of this is just the tip of the iceberg, as far as propaganda goes. But all of that is something to be written up another time.